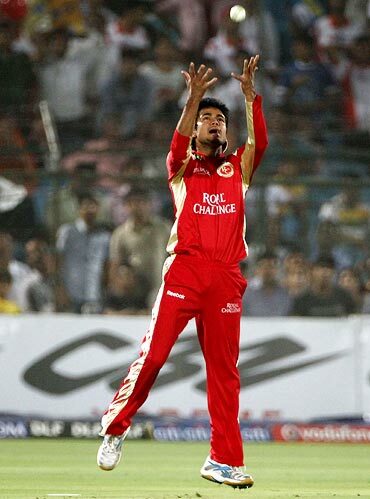 Royal Challengers Bangalore got off to a good start with early wickets. Michael Lumb (9) got himself needlessly run out in the third over while two balls later, R Vinay Kumar (0) induced an inside off Amit Paunikar and Robin Uthappa made no mistakes behind the stumps. It was Vinay Kumar's 16th wicket in the campaign and put him second - behind Deccan Chargers' spinner Pragyan Ojha - in the race for the Purple Cap. 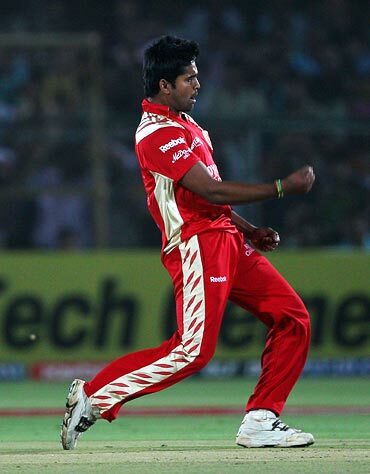 Pankaj Singh, playing in his first match in this edition, was handed the ball in the first over and he struck in his second ball, having Naman Ojha (7) caught by Manish Pandey at midwicket. Moreover, Singh's opening over also turned out to be a maiden, a rarity in this format. 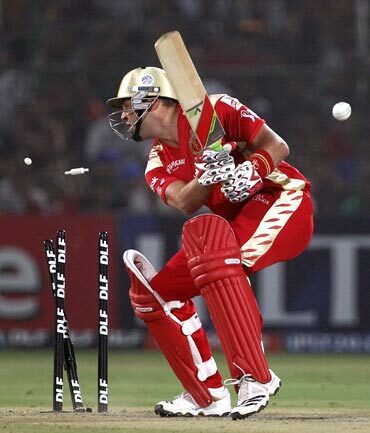 Jacques Kallis had Shane Watson (22) caught by Kevin Pietersen at square leg to add to Rajasthan's woes. And Singh came back to have Abhishek Jhunjhunwala (13) caught by Anil Kumble at mid-off to add to the misery and finish with respectable figures of two for 27 in four overs. 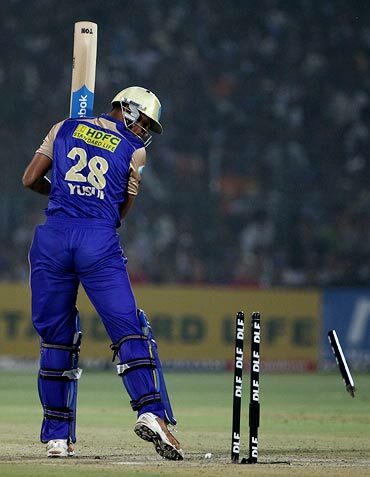 Yusuf Pathan (11) hit successive boundaries to ease the pressure and in the process became the eighth batsman to score more than 1000 runs in the tournament -- a feat achieved in his 42nd match. But Dale Steyn returned to uproot Pathan's off-stump in the 14th over to end Rajasthan's hopes of a competitive total. Abhishek Raut (32 not out) and Adam Voges (28 not out) put on 58 runs for the seventh wicket to take their team to the eventual score -- 24 runs coming in the last two overs. The hosts finished on a modest 130 for six in their stipulated 20 overs. Kamran Khan, playing in his first match of the edition, gave Rajasthan a perfect start with the ball cleaning up Jacques Kallis for a duck. Kallis tried to cut a short delivery but it stayed low, taking the outside edge back on to the stumps in the second over of the innings. Manish Pandey (14) joined the party with two boundaries in thrree balls off Siddharth Trivedi before perishing in pursuit of a third - in the process hitting straight to Yusuf Pathan at extra cover. Kevin Pietersen seemed in control right from the start. The Englishman smashed the first ball of Shane Watson's second over to the square leg fence and two balls later, helped himself to another boundary, this time in front of square. Pietersen went ballistic in Kamran's second over blasting 18 runs - including three boundaries on the trot followed by a massive six over midwicket. 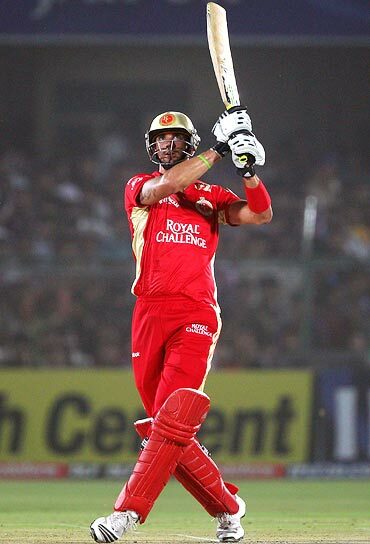 Pietersen continued finding the boundaries as he helped himself to three more boundaries in Adam Voges' first over. He completed his half-century of just 24 deliveries in some style with a boundary off Warne. The former Bangalore captain was run out after a splendid innings of 62 from 29 balls, having hit 10 boundaries and two sixes. The in-form Robin Uthappa got into the act with immediate effect, with a boundary each of Trivedi and Voges. Uthappa the cleared the ropes off Warne for his 25th maximum -- the most in the tournament, ahead of Yusuf's 24 sixes. He, however, was unlucky to be ruled out stumped by the third umpire off Warne for 26 in the 11th over. Closer looks at the replays indicated that the Bangalore batsman had got some part of his foot back inside the crease before wicketkeeper Ojha had taken off the bails, but the third umpire ruled in favour of the bowler. Bangalore reached 132 for five in 15.4 overs to win by five wickets to complete the double on Rajasthan this season and jump to second in the standings.